African tick bite fever is a bacterial infection akin to influenza which travelers to sub Saharan Africa or the West Indies need to be aware of. The first diagnosis of this type of fever took place centuries ago but later it started getting confused with Mediterranean spotted fever. Scientists who researched these diseases determined that they were mainly contracted after coming in contact with infected cattle or ticks found on wild animals. The main species of ticks causing African tick bite fever and its related long term symptoms is the Amblyomma tick which is mostly found in sub Saharan Africa as well as parts of the East Caribbean islands. Influenza like symptoms-fever, body ache, chills, fatigue, headaches, dizziness. 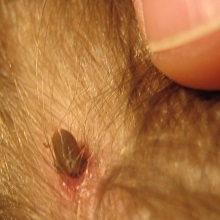 Inoculation eschar- This is a skin lesion at the site of the tick bite. Multiple lesions might be present. These are red, crusty and painful or inflamed. There may be swelling in the glands. South African tick bite fever generally does not cause a rash as in other tick bite cases. Symptoms of the fever usually appear 2 weeks (or 6-7 days) after the bite has occurred. The symptoms are most commonly seen in parts of Zimbabwe, Tanzania, Kenya, Botswana and parts of Caribbean. Diagnosis of African tick bite fever is done through a biopsy or, in most cases, a simple blood test. This can help reveal if there is an infectious pathogen present. A test called immunohistochemical staining is also done to determine if rickettsial organisms are present. Diagnosis is often delayed since the antibodies are usually released only after a few weeks from when the bite has first occurred. How is the fever treated? African tick bite fever is treated with antibiotics. 2 week course of oral Doxycycline Hydrochloride 100mg twice daily is usually prescribed. Patients generally feel better after taking these, though in some cases, the fever may leave long term symptoms such as joint pain, fatigue etc. Residual scar at the inoculation site may also be present for a while. The complete course of medication must be taken even if you start feeling better; else the infection might recur. Wearing shirts with full sleeves and full pants. Covering or tying loose ends of pants or tucking its ends inside socks. Shoes must be worn when hiking along grassy trails or wooded areas. Always walk in the center of the trail while avoiding grass as far as possible. Spraying the entire body and clothing with 20% DEET spray. This is an insecticide that is known to deter most bugs. Make sure the product does not get in the eyes. Using permethrin treated clothing or gear. Most treated fabrics remain effective for up to 100 washes. Avoid spraying permethrin based sprays directly on the body. Examine all the members of your hiking group closely for ticks. Do not forget to examine the hair, as ticks can hide in it. If a tick is found attached, use the following steps to remove it completely. Use tweezers to grasp the tick near its head close to the skin. Do not squeeze the tick or its blood could go back into the site of bite leading to infections. Firmly yet gently pull the tick out ensuring no mouthparts are left behind. Dispose off or store the tick for taking it to experts for identification. Wash your hands as well as the bitten area using an antibacterial soap. Ensure that your clothing and hiking/camping gear is free from ticks. Wash all items in hot water after returning home. If you feel sick and believe you experience fever-like symptoms, make sure you visit the doctor immediately. Inform him/her about the travel. Contracting African tick bite fever is no fun especially after a nice safari in the jungles. We hope this information comes in handy to help you diagnose and prevent long term problems related to African tick bite fever.